If you wish your teeth weren’t stained or discolored, you’re not alone. Did you know that around 80% of Americans wish they had whiter teeth? Demand is the main reason why you may see so many different whitening products at your local store. However, these over-the-counter products don’t deliver the same results as professional teeth whitening. Keep reading to learn some of the ways your smile can become stained and how professional teeth whitening with your cosmetic dentist can help. Why Are My Teeth Yellow or Discolored? Discoloration can occur for many reasons, but sadly, it is inevitable. As you grow older, your tooth enamel faces wear and tear that will eventually leave them looking lack-luster. Along with age, stains and discoloration can be caused by foods or drinks rich in color like coffee, wine, pasta sauce, and more. Additionally, smoking and tobacco products can dramatically discolor and yellow your teeth through habitual use. Why Should I Choose Professional Whitening? With all of the in-store products available, you may be wondering why it’s worth it to get whitening from your dentist. The main reason is that in-store whitening is weak. These products don’t utilize professional grade whitening gel, and they don’t have the special technology available to provide a quick and safe treatment. Many in-store products can irritate your gums because the whitening trays are one-size fits all. Your dentist uses Kor in-office whitening for the safest and most effective treatment. This professional whitening is customized to your smile, and the whitening gel can penetrate beneath the surface of your teeth to remove tough stains. This is something that simply can’t be done by in-store products. Another benefit of in-office whitening is that it’s administered by a professional. Some patients may not be suitable for teeth whitening, depending on the condition of their oral health. That’s why seeing a dentist for teeth whitening is much safer. 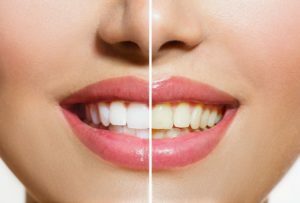 You’ll have a professional to evaluate your grin and recommend the proper treatment for your stains and discoloration. If you’re not a candidate for whitening, they can recommend dental bonding or veneers to give you a beautiful set of pearly whites. Does it sound like you could benefit from Kor in-office whitening? Contact your cosmetic dentist to get started on a dazzling, bright, and beautiful smile. Dr. Hodong Kwon is an expert dentist with additional experience and training in sleep apnea and Invisalign orthodontics. He enjoys offering professional teeth whitening to boost his patients’ smile confidence in Dallas. He currently runs his own practice, and he can be contacted through his website or by phone at (214) 350-8608 for any questions.